Use the guide below for our suggested minimum quantities of grass mesh fixing pins to keep the plastic grass protection mesh secure and flat to the grass surface. We always recommend more than less if you budget allows. Mega pack of 1000 steel U-Pins for grass reinforcement meshes. Manufactured from 6mm diameter ribbed steel and are designed to be strong enough to hold the thick grass protection mesh firmly in place in most soil types. 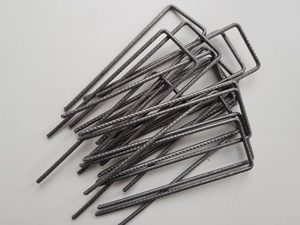 The grass mesh U-Pins are 70mm wide, making them the perfect width to straddle a few plastic mesh apertures and leaving the metal pin below the meshes top surface. 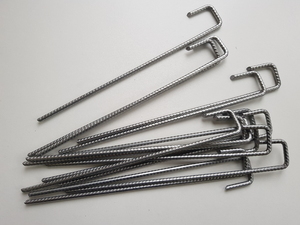 These steel u-pins can also be used on rabbit fencing and welded wire mesh fencing to fix the base to the ground - limiting burrowing animals getting through. U-pins are easily installed by using a club or claw hammer. Size 170mm x 70mm x 6mm dia (1000 pack).